Every girl definitely desires and dreams of having a healthy, long, thick hair, at least every Indian girl. But not everyone is blessed with a long healthy, fully nourished hair. There are some things which we can try doing to provide some nourishment to it, shampoos, lotions, conditioners, oils are all part of it and all these cost a lot for us. Many of us might be always trying new products and new brands to see better results. It can actually harm your hair. Many feel that hair will get full nourishment only with costly hair spa treatments. We cannot get all those things in the budget at our home, but we are here to prove you wrong as we have got some east to try homemade oils for hair. So, here we take you through a few recipes for the homemade oils for hair growth and a healthy hair, don’t miss to try them, use them. Hibiscus which is usually considered of using for religious purposes alone by Indians, but in fact, it has got many other benefits that you must try for sure. 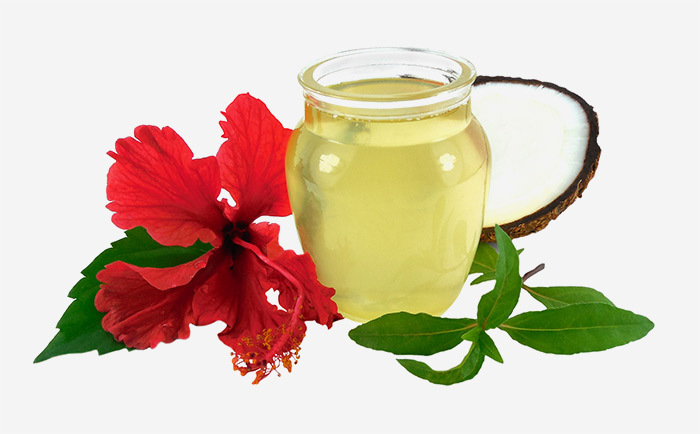 Hibiscus oil for hair is good as it helps your hair by making it glow naturally black and grow long. First of all, you need to wash off the hibiscus leaves, flowers thoroughly under fresh flowing water. Let them dry under the sun until they are completely dry. Then take a pan, put it on the stove, then add ¼ cup of coconut oil, ¼ cup of almond oil to the pan, then add hibiscus leaves, leaf petals to the pan ( you can take ½ cup of petals, leaves). Allow it boil for a few minutes and then rest to cool, then strain out. Take it into a bottle to use it on your hair. Amla which is the Indian gooseberry is considered as a natural tonic for a healthy hair. This can be a great long hair oil that you can consider using for your hair growth. This oil even gives you relief from the stress, so consider making this oil with our easy to make recipe. While heading towards the preparation of this hair oil, you need to take 2 fresh amlas. Cut them into small pieces, dry them under the sun for about an hour. Then take a pan, put it on the stove. Then pour all the ingredients the 4 tablespoons of coconut oil, 2 tablespoons of sesame oil. Finely cut amla into the pan, allow the mixture to burn in the pan until it stops bubbling and switch off the stove. Let it cool, then take it into a bottle that allows you to use easily for your hair. This is another really useful homemade hair oil for hair growth that you should consider to make at home with these simple steps. Mint is such an easily available ingredient in all of our homes and if you have got the ingredient you have got the healthy hair, go for it. First of all thoroughly clean the mint leaves under fresh flowing water, crush them slightly. Then put them in a container, then pour in some almond oil inside the container by covering the mint leaves completely. Place the lid on the container, place it at a place where it gets some sunlight. Shake the container once in a while, leave it for 3 days. Strain it, pour the oil into a bottle, so that you can use it easily for your hair. This is another very useful hair oil that one can make at home to get rid of the most common hair problem and that is dandruff, so if you are a sufferer of dandruff, then you should try making this for sure. It works great on dandruff, thus making your hair healthy and thus allows it to grow. You need to take the peels of oranges, lemons. Let them dry under the sun completely, then make it into a powder by grinding them together. Then take a pan, put it on a stove, then add coconut oil to the pan. Then add a little amount of this orange, lemon peels powder to this oil, allow the mixture to burn until it starts evaporating. Then switch off the stove. Let it cool, then strain it into a bottle to use it whenever you need. Tulsi the natural herb that is present in almost all of our homes but we don’t consider of using it for various purposes as it has got some religious respect from us. But you just cannot ignore the various uses of tulsi. It is a really good ingredient for many health issues, it cures a cough, cold, prevents cancer. It is even good for your hair, so go try this tulsi herbal hair oil. 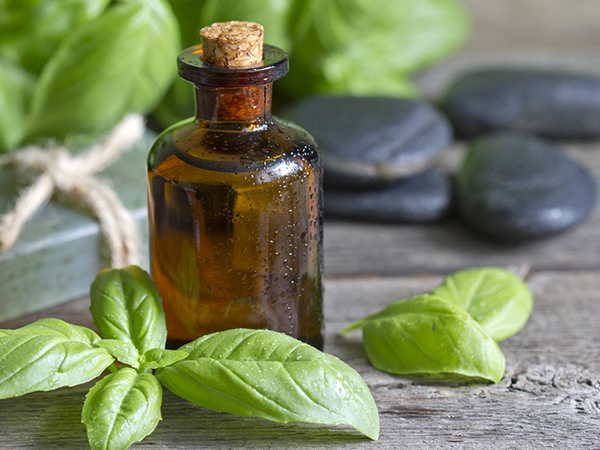 This tulsi hair oil will give you relief from your itchy scalp. 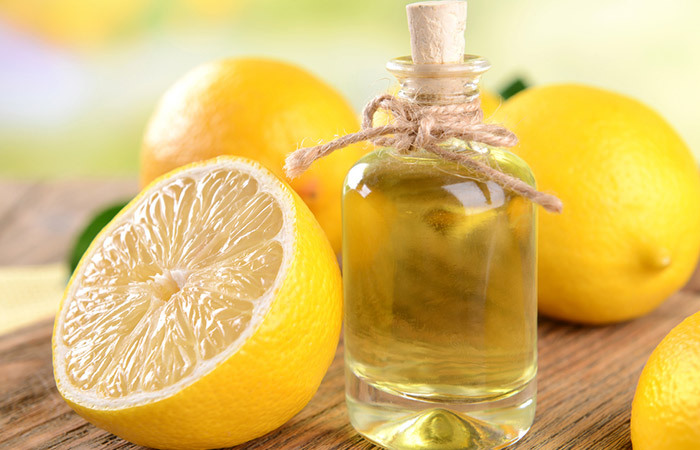 This is another simple to make homemade oils for hair that you can try at home. Take a bunch of tulsi leaves, grind them with a bit of water, make it into a thick paste. Take a pan, then add coconut oil to it, also add this tulsi paste and add a few fenugreek seeds to the pan. Then let it burn for a few minutes, strain it, take it out into a bottle, store it to use it for your hair. Also Read: Cholesterol Spa To Rejuvenate Your Hair: Have You Tried It Yet? Curry leaves help restore melanin, the pigment that gives your hair its natural color, in the hair follicles. It is also rich in vitamin B which is vital for hair growth. The mixture of curry leaves and coconut oil for grey hair makes your hair strong and restores elasticity. Heat the curry leaves and coconut oil in a small saucepan until you see a black residue forming. Turn off the flame and let the oil cool. Massage your scalp well and leave the oil in for at least an hour. Wash with shampoo and then condition. 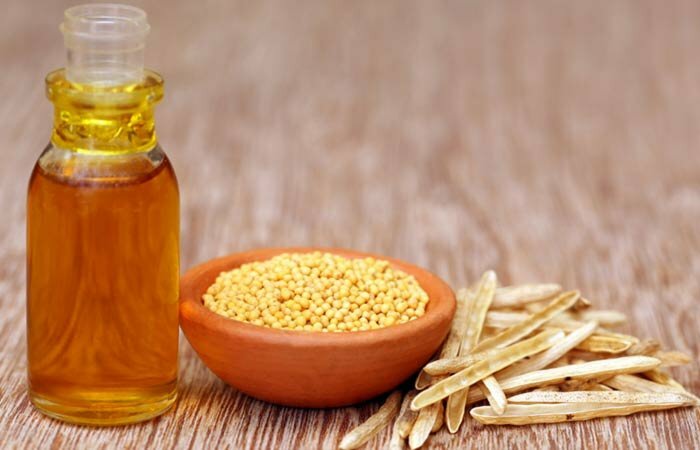 Mustard oil contains zinc, calcium, iron, magnesium, and selenium. It is a rich source of minerals that keep your scalp nourished while the high protein content of castor oil repairs and prevents damage. Proper nourishment is key is preventing grays. This oil blend will also speed up the rate at which your hair grows and improves hair health in terms of shine, smoothness, and strength. Combine the oils and heat them for a few seconds until they’re warm. Apply the warm oil to your scalp and hair. Massage your scalp for 10 minutes and let the oil sit for an additional 45 minutes. Wash your hair thoroughly with shampoo and then condition. Aloe Vera gel has tremendous hair benefits. It contains 20 different amino acids that strengthen and moisturize the hair, because of their water-attracting quality. The two important vitamins present in aloe vera gel, vitamin A, and vitamin E prevents hair from drying out and breaking, repairs damaged hair follicles, promotes hair growth and keeps your tresses silky and smooth. This homemade aloe vera hair oil stimulates new hair production, strengthen weak hair and prevents hair fall. It heals and soothes dry, itchy scalp caused by dandruff or scratches. It moisturizes, nourishes and balances the pH level of the scalp and hair. Cut open an aloe vera leaf into two equal halves and extract, aloe vera gel into a bowl. Take 1/2 cup of this freshly prepared aloe vera gel and mix with coconut oil. The ratio of aloe vera gel to coconut oil should be in the ratio 1:1. Heat the mixture on a low heat for 5 to 7 minutes. Remove from heat and let it cool down completely. Mix 5 drops of rosemary essential oil and pour this oil into a clean dark bottle. Store the oil in a cool, dark place for max 2 weeks. So, go try these simple, easy to make homemade oils for hair with the easily available ingredients at home. Make your hair, healthy, long hair.